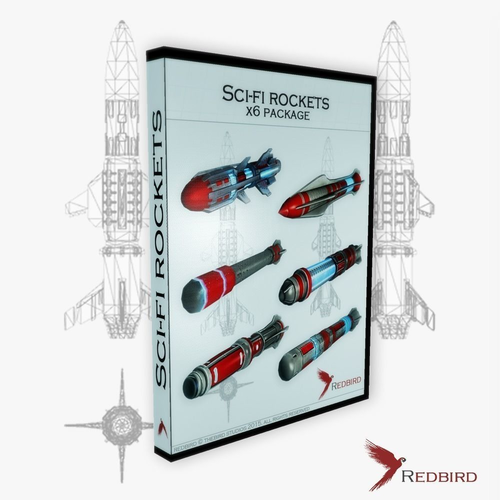 Low poly and game ready model of Sci-fi Heavy missiles collection; This package includes x6 different models, each model has: Includes 2048x2048 .png textures; Consists of 1 object and 1 material. Each material includes UV, textures and maps; Textures and maps included: Diffuse, Normal, Specular, Glossy, Emission; Original file is .blend for each model; Also includes Game ready Unity scenes; Made in Blender 2.78; Rendered with Unity 5; Each .3ds, blend, dae, fbx. max, obj, textures and unitypackage files are in archeives; You save 5$, buying this package!